"Here is a photo of myself, taking in July 1977 while I was winning the Sears Point AMA Superbike race. It doesn't show the bike all that well, but it's a pretty good action shot. I'm exiting turn 11, the slow right-hand hairpin. It was a 1976 (I think) 900SS. It was sold with the weird left shift with the crossover shaft, I think that was the 76 models only. (We quickly converted back to right-foot shifting). It was a square case motor, but we put a round case clutch cover on it. Besides looking better it gave me a little more ground clearance on that side. Yes, I did sometimes drag the side covers, but only a little -- never enough to lever the tire off the road. The off side had the uglier square case cover, as the alternator was larger on the square cases and the right side covers couldn't be interchanged. 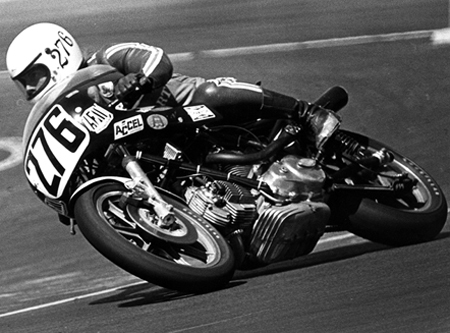 In 1977 we ran only the AMA's three California races, which were Sears Point, Laguna Seca, and Riverside. I was first at Sears with Cook 2nd, I took a 4th at Laguna Seca (where I had not raced before) and a third at Riverside (where Cook was second just barely behind Wes Cooley's Kawasaki). Not bad: three races, two podiums including one win, and a forth. It was a fun year!"